Vitamix 5200 vs. 5300 – Which is best? The Vitamix 5200 and it’s counterpart the 5300 are two of Vitamix’s most popular blenders – and for good reason. These classic blenders offer the high quality performance and durability that Vitamix is known for, but at a more affordable price than the next generation models. That’s why they made my list of the 5 best Vitamix blenders. But when it comes to actually comparing the Vitamix 5200 vs 5300, which model comes out on top? The controls and the base layout of the Vitamix 5200 and 5300 are almost identical. There are however a few key differences that need to be highlighted before deciding which blender is best for you. The major difference between the 5200 vs. the 5300 is that the 5300 comes with a built in pulse switch. Pulsing is great when you want to achieve a chunkier texture for something like a salsa, or to roughly chop vegetables for soups. While you can still pulse on the 5200, you have to do it manually by flipping the on/off switch which isn’t ideal. The Vitamix 5300 is the winner here with its built in pulse function. Otherwise the blender controls and interfaces are practically identical. The Vitamix 5200 and 5300 both have large batch 64-oz pitchers. These are perfect for family sized portions or for making multiple servings at once. Both blenders are also compatible with Vitamix’s medium 48-oz pitcher and personal 20-oz pitcher, but these are sold separately. Although the pitcher capacities are the same, the dimensions are different. This is where Vitamix made the biggest improvement from the 5200 to the 5300 models. One of the most common complaints with the 5200 is that it doesn’t fit under standard kitchen cabinets. Most kitchen cabinets are 20″ above the countertop while the total height of the Vitamix 5200 is 20.5″. To fix this issue, Vitamix made the 5300 with a total height of 17.25″ and widened the pitcher to maintain the 64-oz capacity. The Vitamix 5300 is the clear winner here thanks to its shorter pitcher. This allows it to be used and stored on standard countertops while simultaneously making it an easier fit for dishwasher cleaning. Technically the Vitamix 5300 at 2.1 horsepower has a stronger motor compared to the Vitamix 5200 at 2 horsepower. In practice however, this difference is negligible. Both blenders have commercial strength blending capabilities and can blend everything that you would expect from a Vitamix. It’s a draw! Although the Vitamix 5300 sports a slightly stronger motor than the Vitamix 5200, it’s not enough to have any noticeable impact on blending quality or capabilities. 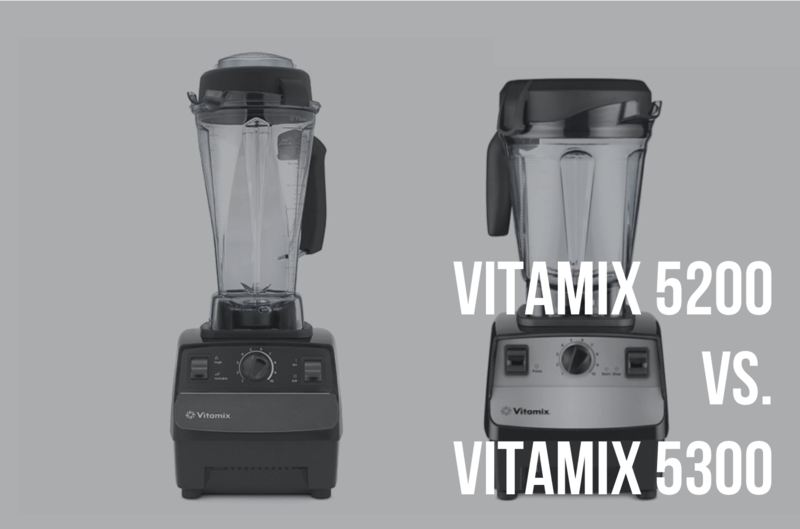 When it comes to the pricing of a Vitamix 5200 vs 5300 you have a few options. You can buy your blender brand new (not recommended, you can get a next generation Vitamix 7500 for the same price) or you can get a Vitamix ceritified refurbished model. Buying a Vitamix 5200 or 5300 refurbished is definitely the way to go but I’ll explain why in a minute. Buying refurbished will save you anywhere from $100-$200+ on a Vitamix blender. But how does the quality compare? As far as quality goes, a Vitamix refurbished blender can be considered as good as new (only much cheaper)! Each refurbished blender has to pass the exact same inspection process that a brand new Vitamix blender goes through. Refurbished blenders consist of lightly used returns or display models. Any worn or visually marked parts, as well as the lids, pitchers, and tampers are all replaced with brand new parts. Each blender is then repackaged in the same packaging that a brand new blender comes in along with the recipe book. Refurbished blenders also come with a 5-year warranty, so if it’s defective in any way you can send it in for a replacement free of charge. The only difference between new and refurbished is the price tag! The Vitamix 5200 is the winner when it comes to price. Although if you are buying a refurbished model (highly recommended), then the difference in price is only $30. Overall, these blenders are very similar. Ultimately though the 5300 is the better blender. It is the next generation model of the 5200 and Vitamix did a great job of keeping what was working on the 5200 while improving what wasn’t. The biggest drawback of the 5200 was its cumbersome pitcher height and this was fixed on the 5300. The 5300 also comes with a pulse feature and has a slightly stronger motor. Although it isn’t strong enough to really notice a difference, it definitely doesn’t hurt. The Vitamix 5200 is slightly cheaper than the 5300 but at only a $30 difference you are better off spending a little extra and getting the improved 5300 instead. The Vitamix 5300 is the obvious choice. It is improved or equal to the 5200 in every way and will only cost you $30 more.